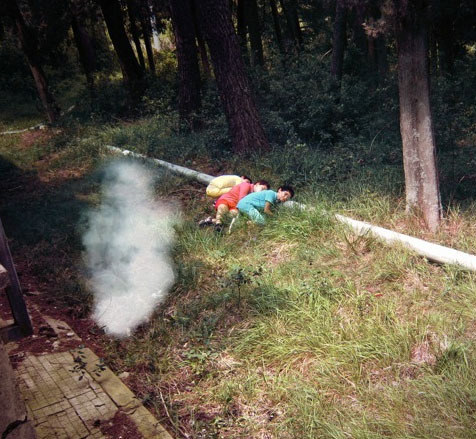 Children of Unquiet is a collaboration with a group of children in Italy with whom the artist Mikhail Karikis orchestrated a children’s "take-over" of the abandoned workers’ villages and adjacent industrialized locations in the geothermal area in Tuscany known as The Devil’s Valley. The striking vaporous landscape is also marked by distinct subterranean and industrial sonorities which form the basis of a new sound piece. In the resulting film 5 to 12 year-olds come to occupy the deserted natural, residential and industrial sites by playing in the scorching vaporous wasteland; reading among the dilapidated modernist villages; and singing the roaring geothermal sounds and industrial hums that form the soundscape of their childhood. This project takes place at the very site where green energy production was invented in 1904, and where the very first (and still one of the largest) geothermal power plants in the world was built. Until recently the area was inhabited by five thousand workers and their families, but unemployment following the introduction of automated technologies in the factories, and the lack of future opportunities for the young are resulting in rapid depopulation of entire villages which are iconic for their utopian architecture. In Children of Unquiet a desolate site exudes new potential unleashed out of the ruins by a community of children. Their take-over and song generate the opportunity for individual and communal expression, asserting the younger generation’s connection with the site of their childhood, challenging the narratives of obligatory migration that dominate them, and suggesting different possible, desired or imagined futures. This work is the culmination of a quartet of projects exploring notions of work, the effects of post-industrialisation on different communities, and the poignant role sound plays in highlighting different aspects of community formation and resistance. Supported by Arts Council England, Radio Papesse, Art Sheffield and Site Gallery. Featuring Coro di Voci Bianchi Guido Monaco and children from Larderello, Italy.